There were no packages waiting for the employees, who had received a phishing email encouraging them to click to track an incoming package. The message did not say that it was in the mailroom – but when the workers decided to get proactive rather than click the email, the mailroom got crowded quickly. Puzzled calls by mailroom staff eventually revealed the source of the confusion: the IT-security team had been proactively phishing the employees, testing to see whether they would click on a message notifying them of an impending delivery. 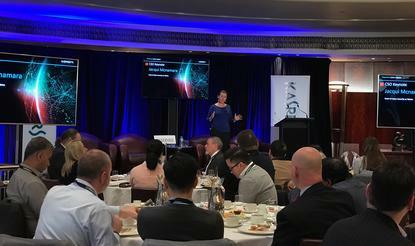 But nobody predicted the action many employees would take – and this, Telstra head of cyber security Jacqui McNamara told a capacity crowd at this week’s CSO-Kaspersky Lab Cyber Insights event, highlights the universal problem that security executives face in teaching people to be secure. Tracking down ‘unknown unknowns’ is a continuous effort in a company the size of Telstra, whose tens of thousands of employees each present a different combination of potential security benefits and challenges. To overcome the issues around human fallibility, security managers need to remember that well-trained users can be a major help in improving overall security posture. The same goes for partners and suppliers, she added, with many entrusted to access credentials and security executives needing to evaluate those suppliers own internal security policies and procedures. Telstra handles this during supplier on boarding as “reinforced authentication”, McNamara said, to ensure that suppliers have been appropriately vetted and remain part of the ongoing security defence. Employees were a significant part of this defence – particularly those who work in other areas of the business and had embrace solutions like recently-compromised recruitment firm PageUp, which affected Telstra. To avoid unexpected damage from such incidents, security executives needed to reach out across both business and IT to ensure that business units amassing data do so safely and carefully. Sometimes, though, even the most proactive organisation can catch itself out – as happened with the mailroom example, when Telstra’s Cyber Influence team sent out a well-meaning phishing email and numerous staff ended up storming the mailroom in a totally unexpected consequence. And while proactive testing was important in engaging with staff about security, security teams also have to be careful not to let the pendulum swing too far the other way. If staff get too nervous about cyber threats, productivity may suffer – and security teams may be swamped with enquiries or suspect emails forwarded from well-meaning but spooked employees. “We need to shift the way we think about [engaging with staff],” she explained. “We are creating a little bit of analysis paralysis and fear in the system.